No matter how all made and dressed up you are, when dental health is taken for granted, it can totally demerit your overall look. 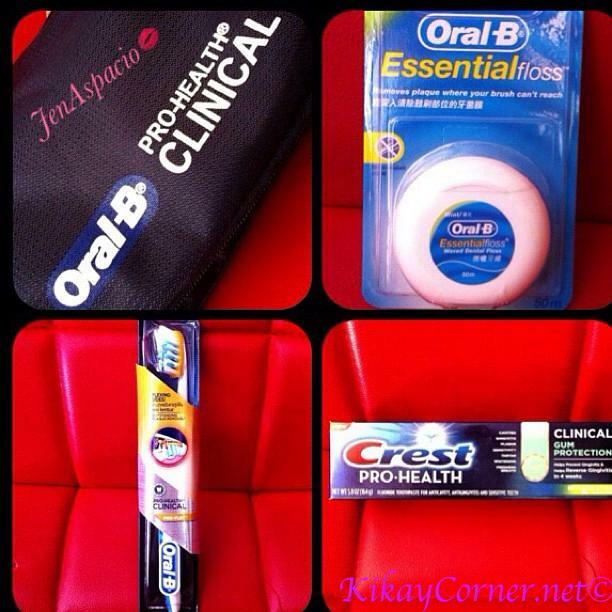 Here is something I have been using for a whole month now – Oral-B Pro-Heath Clinical Pro-Flex toothbrush and Crest Pro-Health toothpaste. Oral-B Essential floss, I have been using for decades but had to stop to make way for interdental brushes because of my oral braces, (which I can’t wait to get off of). Oral hygiene should always take priority, even as medical experts agree that poor dental health can actually lead to a handful of serious diseases. Department of Health’s study that “92% of Filipinos are suffering from dental caries while 78% suffer from gum disease,” we are far from totally saying goodbye to the most common dental health problems such as bad breath, tooth decay, gum problems, and unattractive smile. Oral-B Pro-Heath Clinical Pro-Flex toothbrush uses a combination of Cross-Action technology and individual Pro-Flex wings, which effectively removes plaque and is gentle on teeth and gums. It can remove up to 93% of hard-to-reach plaque. Use it with Oral B Crest Pro-Heath Clinical Gum Protection toothpaste in Invigorating Clean Mint flavor. This toothpaste is clinically proven to help reverse gingivitis in just 4 weeks, giving you an invigorating sensation while it improves your gum health, fights cavities, teeth sensitivity, tartar build up and plaque, which freshens breath and whitens teeth.